회암사는 고려 충숙왕 때인 1328년에 승려 지공(指空)이 창건한 사찰로, 그 제자인 나옹(懶翁)이 불사를 일으켜 큰 규모의 사찰이 되었다. 조선 태조 이성계가 각별히 관심을 가졌으며, 왕위를 물린 후에도 이 곳에서 머무르며 수도생활을 한 것으로 유명하다. 절터의 동쪽 능선 위에 지공과 나옹 그리고 무학의 사리탑이 남과 북으로 나란히 서있고, 그 남쪽 끝에 이 석등이 자리하고 있다. 바닥돌과 아래받침돌은 하나로 붙여서 만들었으며, 그 위의 중간받침돌은 쌍사자를 두어 신라이래의 형식을 따르고 있다. 쌍사자는 가슴과 배가 서로 붙어 입체감이 없고 엉덩이가 밑에 닿아 부자연스럽다. 윗받침돌에는 8개의 연꽃모양을 새겼다. 불을 밝혀두는 곳인 화사석(火舍石)은 2개의 석재를 좌 우에 놓아 그 간격으로 생긴 2개의 공간이 창의 구실을 하고 있다. 지붕돌은 두꺼우며 처마밑이 반원모양으로 들려 있고, 경사면은 네 귀퉁이가 두툼하게 도드라져 뚜렷이 표현되었다. 지붕돌 꼭대기에는 둥근 돌 위로 보주(寶珠:연꽃봉오리모양의 장식)가 있다. 기본형이 4각인 형태로 삼국시대이래 고유의 8각 석등형태에서 벗어났다는 점이 주목되며, 충주 청룡사지 보각국사탑 앞 사자 석등(보물 제656호)과 양식이 비슷한데, 만들어진 시기도 이와 같은 것으로 보아 조선 전기의 작품으로 추측하고 있다. 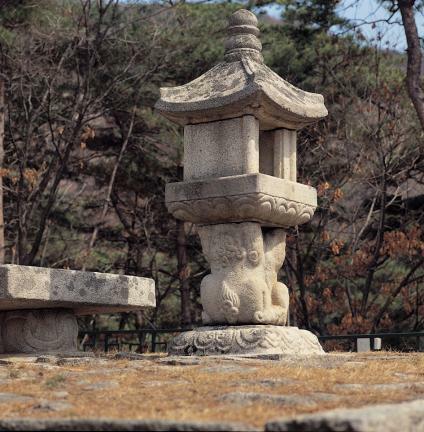 Hoeamsa Temple was constructed by Buddhist monk Jigong in 1328 during the reign of King Chungsuk of the Goryeo Dynasty, and expanded by his disciple, Naong. Yi Seong-gye, the first king of Joseon, supported the temple and underwent monastic discipline himself there after his abdication from the throne. 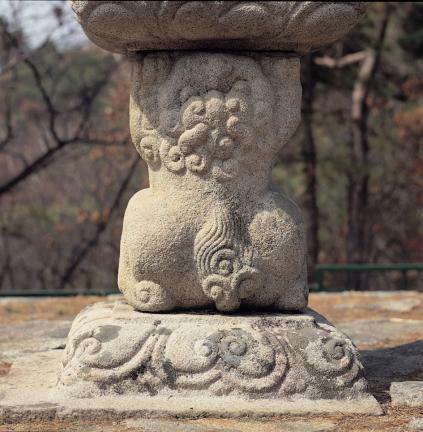 At the east ridgeline of the temple site, the stupas of Jigong, Naong and Muhak stand side by side from north to south, and this stone lantern is located the most southerly among them. The base stone and the lower stylobate are made of one stone. 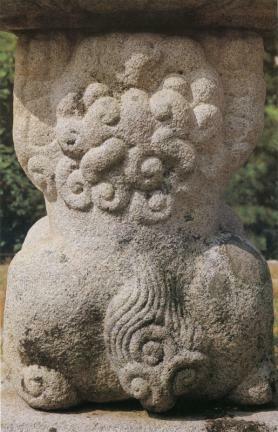 The middle stylobate with carvings of twin lions follows the style popular since the Silla era. 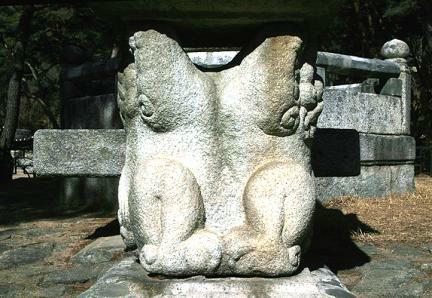 The lions are roughly carved so that their bodies are stuck together from the chest to the abdomen. On the upper stylobate are engraved eight lotus flowers. 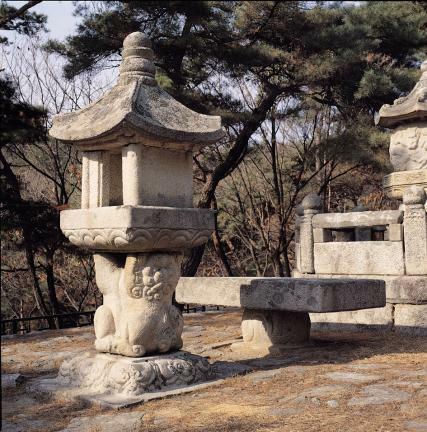 The light chamber of the stone lantern is also roughly made, simply by placing two stone plates in the left and right side each to make two space which function as windows. The thick roof stone has the eaves turned up in the shape of a half-circle at angled positions. The top of the roof is decorated with a lotus bud shaped ornament placed on a round stone. 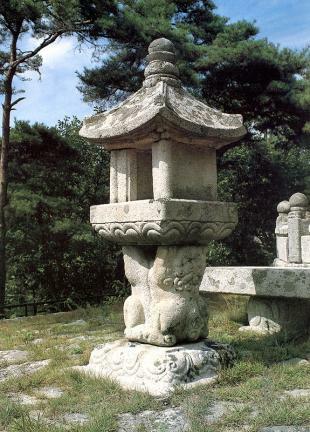 It is remarkable that the basic square form of this lantern departs from the typical octagonal form that had been the rule since the Three Kingdoms period. 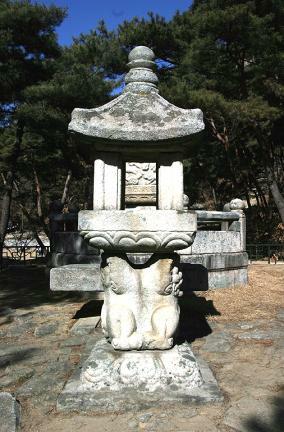 This lantern is believed to have been made in the early years of the Joseon Dynasty, judging from its similarity to the Lion Stone Lantern in Front of the Stupa of State Preceptor Bogak at Cheongryongsa Temple Site, Chungju (Treasure No. 656).